There are two shared 'Glamp' kitchens here at Cosy Under Canvas. 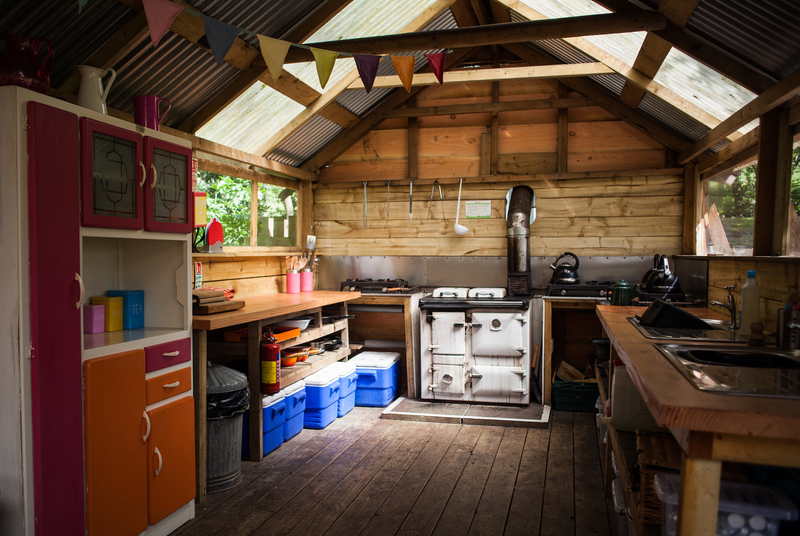 With 6 gas hobs and a wood fired rayburn in the woodland kitchen and 4 gas hobs in the stream side Kitchen. The rayburn is primarily for heating the water for the showers so although we will light it every day, it is not necessary for it to be roaring all day to provide enough hot water. You are welcome to get involved and if you are happy to keep it stoked it's fabulous for slow cooking. A pot of stew can be popped in early morning and be ready for supper that night. Please do not bring pizza’s (unless for the pizza oven), oven ready meals, or any other food that needs a hot oven to cook as the Rayburn is good for slow cooking only. No need to bring tea, coffee, sugar, oil, salt or pepper, it’s all here and let us know if you need milk on arrival. There's pots of fresh herbs planted up next to the kitchens too, so help yourselves! Be adventurous and cook over the open fire. Each dome has its own tripod to stand over the fire, plus a large pot and a griddle to hang from it. The griddle is great for BBQing and the pot is perfect for cooking up a risotto, ratatouille, casserole or stew. If you are looking for ideas there are cookbooks on site for inspiration and we've put together a few recipes we love here. To make it really easy we've also created a selection of Cosy Cook Pots, delicious meals that we've tried and tested and are easy to cook over the fire or on the hobs. We'll shop locally for all the tasty ingredients and let you have them in exactly the right quantities ready to cook yourselves. Armed with these and detailed preparation and cooking instructions you can't fail to cook up a campfire storm. From £17 for a 2 person veggie option. A pizza oven next to the kitchen is a firm favourite with our glampers. When we're fully booked we'll host a pizza night once a week so you can enjoy authentic home cooked pizzas. Everything will be provided so you can relax and enjoy the experience. It's just £10 per adult and £5 per child and we'll keep them coming until you've all had enough! We'll let you know in advance which night we'll be hosting the pizzas so you can be prepared. When we're not fully booked just let us know if you'd like to use the pizza oven and we'll give you a lesson in lighting it and provide the wood. Plus if you don't feel up to making your own dough don't worry just buy your toppings and take advantage of dough pre order service. £10 for 2 adults, £15 for a family of 4. The legendary Jakes' crepes were a roaring success last season. When we're fully booked Jake will be on hand to serve crepes and shakes (and coffee, but it doesn't rhyme!) from our purpose built crepe shack. With delicious toppings including Nutella and maple syrup plus tasty fruit shakes and locally roasted fresh coffee...that's breakfast sorted! One pot dishes can be pre-ordered and be cooked, ready and waiting when you arrive. They can be warmed up at your leisure over the open fire or on the gas stoves in the kitchen. Options include; sausage casserole, chicken and chorizo stew, thai chicken curry, spicy chilli, veggie lentil stew, veggie sausage casserole, thai veggie curry, spicy veggie chilli. All come with home made focaccia topped with caramelised onion and goats cheese, caerphilly and leek or olive and feta. The cost is £10pp and the minimum order is for 6 people. There is also food available to buy at the Cosy Camp Shop. Just the essentials like pasta, sauce, marshmallows, craft ales and cider! Plus some BBQ packs, burgers and sausages. Pre order delicious breakfast in bed to be delivered direct to your door on a morning of your stay. These tasty hampers are packed full of warm croissants, butter and home made jam plus home made granola, Welsh yoghurt, fruit, fresh juice and milk. Add a locally roasted fresh coffee to kick the day off to a fine start! £20 for 2 people and £35 for 4.